Treating both NHS and private patients, we offer an extensive range of general and restorative dental treatments including routine check-ups, root canal treatment and tooth coloured fillings. We also offer a full range of cosmetic and smile make-over procedures such as porcelain crowns, bridges, veneers, flexible dentures and tooth whitening. 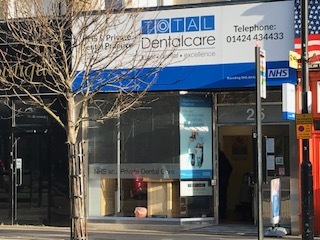 Located just five minutes walk from Hastings mainline station, Total Dentalcare has served the local Hastings community for nearly fifteen years. We welcome new patients and whatever your dental needs, our highly experienced and friendly team will ensure that you always feel welcomed and well cared for at Total Dentalcare Hastings. We are located opposite the Priory Meadow shopping centre, directly opposite the Post Office and WHSmith. By car – Priory Meadow shopping centre has parking facilities and is directly opposite the practice. The Marks and Spencer exit will lead you to the practice (the postcode for Satnav TN34 1PH). By rail – We are a 5 minute walk from Hastings train station (follow signs for Priory Meadow shopping centre and cross the road by the Town Hall onto Queens Road, by Greggs). Services are run by Southern and South Eastern Trains. By bus – Any bus service marked ‘Town Centre’ will arrive within a short distance of the practice. Bus stops are located on either side of Queens Road.